HIGH QUALITY: Our camping cookware set is made of 100% premium stainless steel, anti-corrosion, anti-adhesive, no smell and non - toxic. FOLDABLE & HEAT RESISTANT HANDLE: Heat insulation & foldable handle, uniform heating, properly protect your hands from burning. EASY TO WASH: This hiking backpacking cookware set is a kind of non - stick cookware, easy to wash. COMPACT AND LIGHT - All parts fit inside the pan, which saves storage space and portable with your backpack. 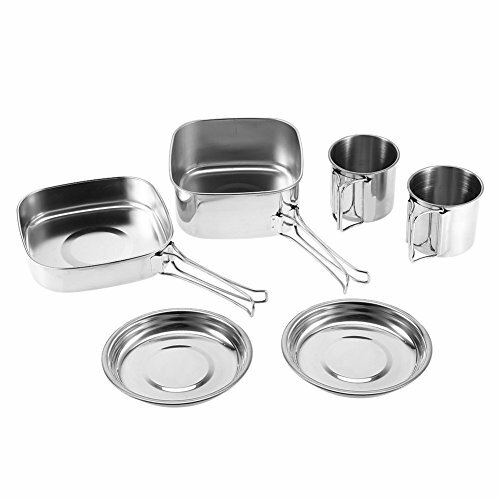 SET INCLUDING - Includes stainless steel Pot x1, Frying Pan x 1, Plate x 2, Cup x 2, suitable for 1-2 person. Perfect for camping, hunting, hiking, backpacking or other outdoor occasions. If you have any questions about this product by Aramox, contact us by completing and submitting the form below. If you are looking for a specif part number, please include it with your message.